Something exciting is coming our way, and this excitement will be in the form of Tim Pearson. He’s the New Jersey born and bred founder of Top Hat espresso catering. Tim and his wife have been catering for private parties, bar/bat mitzvahs and everything in between since January 2013. At the start of his coffee career, Tim found himself learning on his own because the coffee shop he worked for wasn’t nearly as informative as expected. He realized that there were overlooked qualities in coffee that needed to be shared with others. His seven years as a barista, and four years as a roaster have made Tim confident in his ability to create “beautiful rosetta latte art” instead of a “white foam blob.” This didn’t come easy. No one achieves perfection without enduring the strenuous work it entails. He has spent “hours of jittery experimentation” roasting thousands of pounds of beans. The result: this man knows coffee. 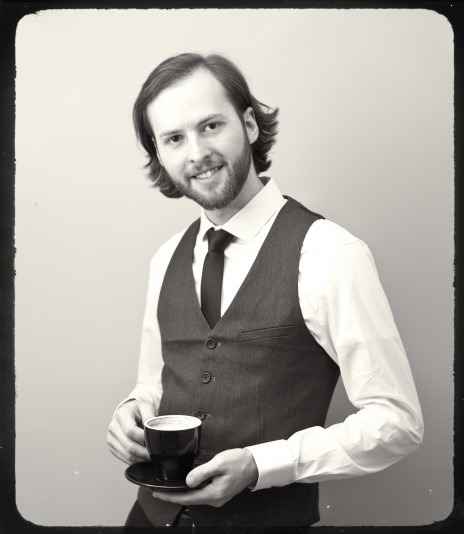 We’re happy to have him as our guest barista this Friday and Saturday. If you want to learn about good coffee, stop by 1101 Spruce to watch Tim do his thing. If you’re interested in having him cater a special event, check out his website at www.Tophat-espresso.com. You can also visit his Facebook page at www.facebook.com/tophatespresso. Trust us, disappointment is out of the question. See you at 11th and Spruce!